As customer preferences and cultural shifts continue to evolve the way consumers want to bank, most community banks are in the process planning strategies or implementing strategies to remain relative or adapt to the massive changes. When developing a branch transformation strategy, it is critical for a successful implementation to start with the people component. Even the newest and most competitive technology, products or services alone will not ensure a sustainable business model in these dynamic times in the banking industry. While the people component is the most important aspect to master early in a branch transformation strategy, it is also the most difficult aspect to master. This is especially true if the organization is operating under or considering moving to a universal banker role. The people component will eventually have the greatest impact and benefits to the bank and customer experience. In order to maximize the results of a universal banker approach, the traditional recruiting and hiring practices must evolve and become more rigorous. Under the universal banker model, banks are in need of talent that can be trained to become a generalist and not just a specialist, as was more typical in the traditional banking model. The FTE savings and overall efficiencies should be one of the main goals and utilizing the Universal Banker model. 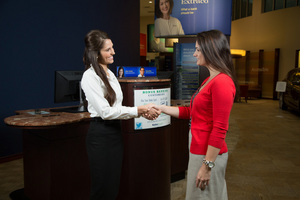 This is a true change in mindset and methodology for most community banks. The first step is to develop the job description and tasks for the new universal banker role, including the expectations and routines. This will be the foundation for building or adapting the recruiting approach. Under the universal banker model, recruiting candidates with banking background is no longer the top priority; in fact, this experience is actually a hindrance to the change management process if the candidate’s experience lies in a traditional banking role. In most community banks, the highest level of turnover occurs on the retail side of the bank, thus making it difficult for most financial institutions to solve the puzzle of recruiting, hiring and retaining the right talent. It is imperative in a universal banker model to streamline the hiring process, while attaining a high level of accuracy for maintaining a low turnover ratio, especially within the first two years of employment. The cost and amount of time to train a universal banker is much higher than the traditional banking model, therefore the cost of a turnover is magnified, placing a larger emphasis on the importance of retaining talent. The hiring process needs to be developed to focus on the underlying natural traits of a candidate. If banking experience is no longer an attribute for a potential candidate, then what type of candidate should a bank, operating under the universal banking model, be looking for and through what type of adapted hiring model? A successful universal banker hiring model focuses on personality, a high energy level and adaptability. In fact, an employee with a change-oriented mindset is almost a requirement these days. Think about the amount of change you as a leader are digesting on a daily basis from payments to virtual tellers to Fintechs, and more. A banker didn’t have to digest this much change five to ten years ago on a regular basis, which reinforces the need for flexibility. An initial screening process must be defined, with an ample suite of questions to allow for flexibility in the interview process to drill down and customize the questions for the specific candidate’s potential weaknesses and strengths. Most organizations experience a high rate of success from implementing a panel interview process with multiple interview rounds, including intellectual exercises designed to flush out the candidate’s true personality and flexibility. While no hiring process is foolproof, including simulations in a multi-round interview process, as an exercise to demonstrate customer interactions, ability and personality traits, is proven more successful than just attaining potentially rehearsed answers to interview questions. In conclusion, focusing on developing a universal banker job description, including levels for career path growth, as well as concentrating on recruiting a new type of candidate, revamping the traditional hiring process to include multi-round panel interviews and designing exercises to simulate a customer experience, provides for a higher rate of success in a universal banker hiring model. Including these components in a branch transformation strategy places a strong emphasis on the people and personality component and provides a higher rate of success in hiring employees that will perform to your expectations, truly fit your culture, understand your products and provide a superior customer experience.